A former librarian and elementary-school teacher from Texas, Laura Bush's marriage to President George W. Bush moved her into the national spotlight. As first lady, she has continued to support the issues that are important to her, including improving education in the United States. 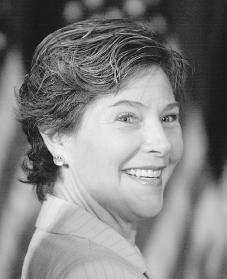 Laura Welch Bush was born Laura Welch on November 4, 1946, in Midland, Texas. She was the only child of Harold Welch, a home builder, and Jenna Hawkins Welch, who served as bookkeeper for her husband's business. Her parents encouraged her early love of reading. They attempted several times to have a second child but were not successful; in some cases the siblings survived only for a few days. This situation added to Laura's shyness and eagerness to please. "I felt very obligated to my parents," she told the New York Times. "I didn't want to upset them in any way." After graduating from high school, Laura Welch went on to Southern Methodist University in Dallas, Texas. She earned a bachelor's degree in early education in 1968. She taught in public schools in Texas for a few years before deciding to earn a master's degree in library science from the University of Texas at Austin. She settled in that city after her 1973 graduation and became a librarian for the local public school system. George W. Bush's father George H.W. Bush (1924–), was planning to make a bid for the 1980 Republican presidential nomination. Laura Bush quit working when she married but took college literature courses. She and her husband had twin daughters, named Barbara and Jenna in honor of their grandmothers. In time, her husband decided to enter politics, and Laura Bush became the wife of the Texas governor in 1995. In spite of her shyness, the new role forced her to become a more public person. She was finally convinced to make speeches, and over the next few years she developed a greater degree of confidence in her ability to speak in public. As the state's first lady, she took up literacy (the ability to read and write) and breast cancer awareness as her causes, raising nearly one million dollars for the state's public libraries. She is also credited with convincing her husband to give up drinking, which he did after she expressed concern that his habits were becoming harmful to his health and their family life. When her husband decided to become a candidate in the 2000 Republican presidential election, as she told another New York Times reporter, Richard L. Berke, their teenage daughters were not enthusiastic. "They didn't want him to run, because they wanted to be perfectly private teenagers like every teenager," Laura Bush said. She may have also wished for a more private life, but as she said, "I would never say to George, for something that he really wanted to do, that he couldn't do that." While campaigning for her husband, Laura Bush managed to make a favorable impression while saying little. She delivered the first major speech at the Republican National Convention in Philadelphia in July 2000. In this speech she discussed her husband's promise to improve early childhood development programs and increase funding for teacher training. She also talked about the home they were building in Texas in which they planned to host the next generation of Bush children. "One day, God willing, George will be a fabulous grandfather. In the meantime, he'll make a great president," she said in conclusion. Bush went on to win one of the closest presidential elections in history, and he took office in January 2001. Although she planned to keep a fairly low profile during her husband's term, Laura Bush was forced to change her plans after terrorists attacked the United States on September 11, 2001. She provided comfort for the country as it mourned the victims and worked to rebuild after the attacks. She became an even greater source of support for her husband as he worked to find and punish those responsible and ensure that such a thing would never happen again. Felix, Antonia. Laura: America's First Lady, First Mother. Avon, MA: Adams Media Corp., 2002.